1696 Atlantic Ocean Route - Check Mate! Antilles Current - A northwesterly current that meets the Florida Current in the Florida Straits where the two merge and become the Gulf Stream, The Antilles Current moves a significant amount of warm water into the Gulf Stream System. Gulf Stream - The core of the warm Gulf Stream current is about 90km. wide with a peak velocity greater than 5 knots. When the Gulf Stream reaches the Grand Banks it branches into the North Atlantic Current and the Azores Current. The branch region is highly active and can have rapid change and lots of eddying activity. 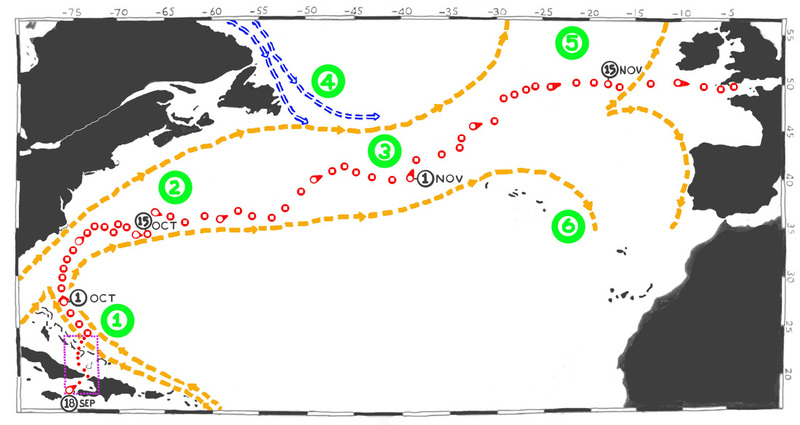 North Atlantic Current - Moves warm Gulf Stream water pole-ward. It originates between the Grand Banks and the mid Atlantic Ridge. It is an extension of the Gulf Stream, and feeds the broader North Atlantic Drift, It is strengthened by the mixing of the Labrador Current and the Gulf Stream. Moves cold water into the Gulf Stream. North Atlantic Drift - Is the northern extension of the Gulf Stream and the North Atlantic current. Azores Current - Is a branch of the Gulf Stream. Near the Grand Banks it has anti clockwise rotations in the northern half, and counter clockwise rotations in the southern half. As it flows southeast and starts to swing towards the southwest off the coast of Africa it becomes the Canaries Current.